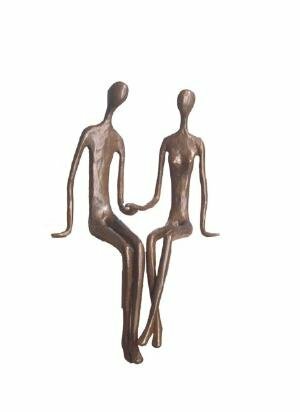 Material: Cast Bronze.This beautiful sculpture of a couple holding hands, evokes love and companionship between a man and a woman. Sitting on the edge of a shelf or a mantel, it not only saves space but also creates a focal point of interest due to its interesting characteristic of not needing a stand. Elegant, artistic and contemporary in feel and design. Portrays the power of intimacy and the closeness of marriage. A wedding or anniversary gift that will last forever.Handcrafted and casted using the sand casting method. Inspired in love and family. Must sit on a ledge. 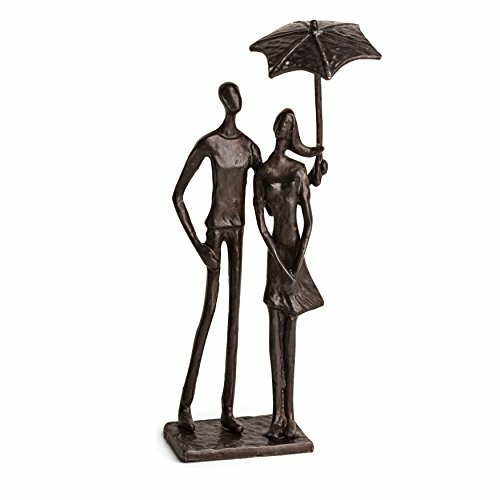 Loving Couple Under Umbrella Bronze Sculpture is a quirky and stylish tribute to the happy couple. This carefully crafted artisanal piece also celebrates the blissful joy of courtship and love, a nifty little gift for your favorite twosome. The sand casted method gives it a smooth, polished finish and is a lovely accent to have in your dresser or mantel. 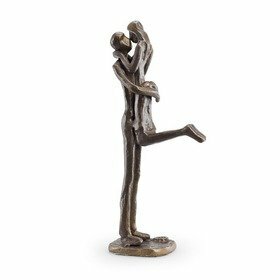 The Loving Couple Under Umbrella Bronze Sculpture truly is uplifting as it is dashing. 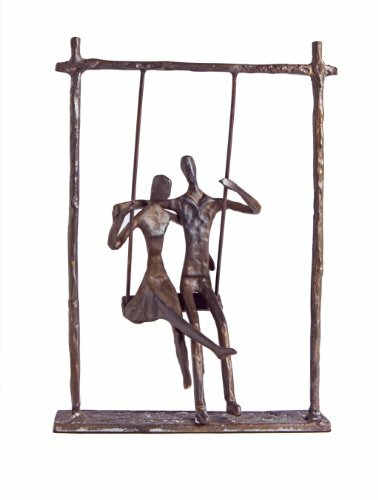 Danya B. is a registered trademark of Danya B. Inc.
A beautifully handcrafted cast bronze sculpture of a couple on a swing. Portrays the power of intimacy and innocent romance. A wedding or anniversary gift that will last forever. Lined with velveteen to protect furniture. Measurements: 9" high x 6.5" long x 4" wide. 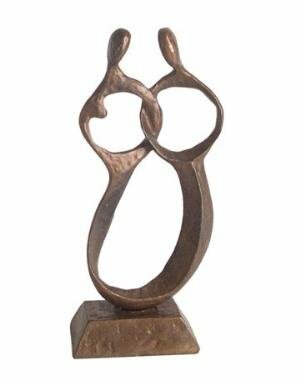 This beautiful sculpture of a couple's kiss evokes love and companionship between a man and a woman. Elegant, artistic and contemporary in feel and design. Portrays the power of intimacy and love. A wedding or anniversary gift that will last forever. Handcrafted and casted using the sand casting method. 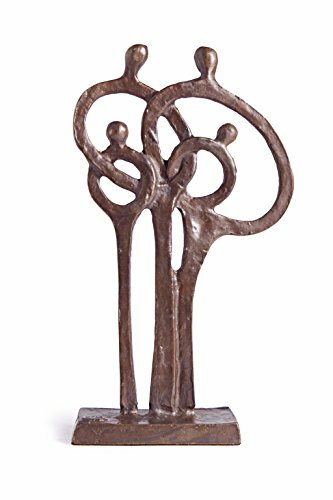 Danya B. is a registered trademark of Danya B. Inc.
Commemorate family with this handcrafted sculpture representing a loving intertwined couple. Made using the sand-casing method, this artistic piece reminds us of the closeness and joy in love and companionship. Bottom-lined with velveteen. 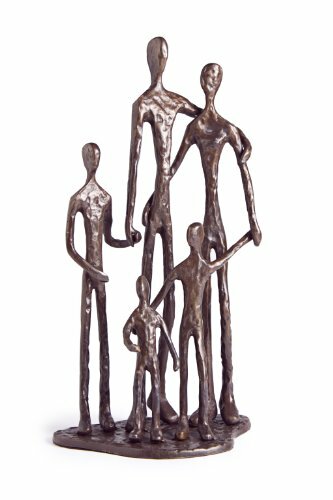 The Family of Five Bronze joyfully celebrates the familial bond of a husband, wife and their children. Compellingly expressing the satisfaction of spending time with your loved ones, this accent piece is bottom lined with velveteen to protect unwanted damage to your shelf, side table or desk. Sand casted by crafts men's hands provide a delicate finish, that makes the Danya B. 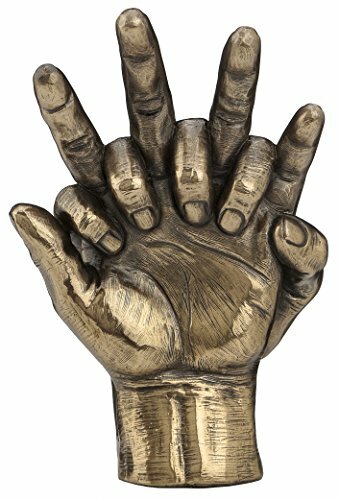 Family of Five Bronze a good welcoming gift for your favorite neighbors. Danya B. is a registered trademark of Danya B. Inc.
Handcrafted sculpture representing a family of intertwined. This artistic piece reminds us of the closeness and joy of family. Made using the sand-casing method. Bottom is lined to protect furniture from damage. Bronze finish. 4.75 in. L x 1.5 in. W x 8.5 in. H (1.1 lbs.). 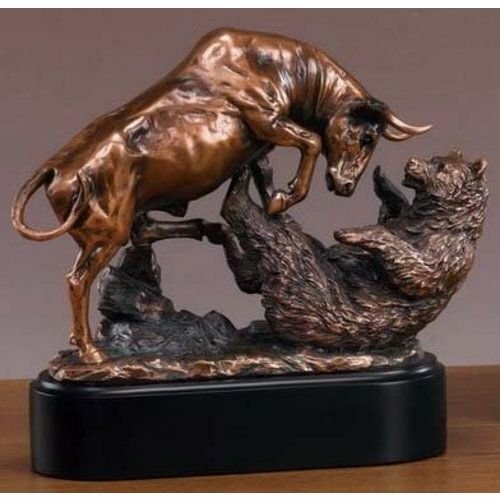 This classic bull and bear scene makes for a perfect and affordable gift for any occassion. These make great incentive awards too! Great detail and quality for the price. 10" w x 9.5" h, 6 lbs. These sculptures are made using a bronze electro-plating process. The result is a fine sculpture with great detail and high quality for less than half the price of solid bronze. 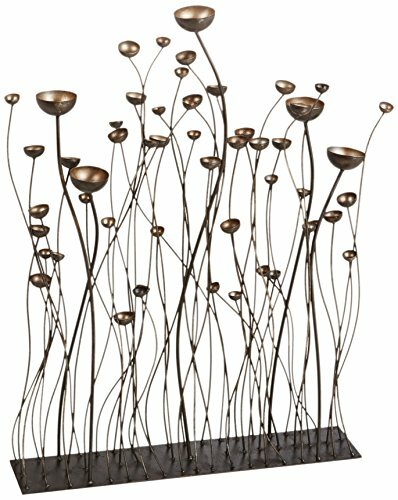 Fraught with movement and line, this contemporary sculpture echoes the brilliantly beautiful tall grasses that silently echo across America's wide prairies. 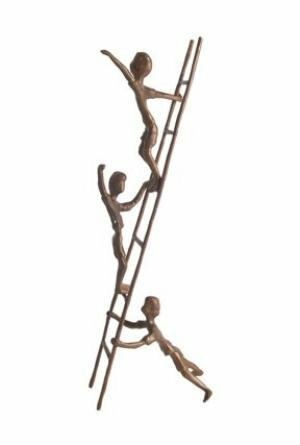 Willowy metal spires arch and reach for the sun in an artistic dance finished in a glossy, faux bronze finish. Add your tealights to the largest bowls to illuminate and cast shadows across a beautiful evening. This three-dimensional, museum-quality sculpt is - as you'd expect - found only at Basil Street Gallery! 24"Wx5"Dx32½"H. 10 lbs. 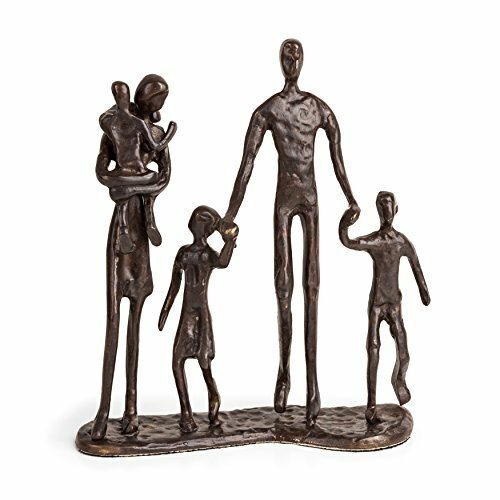 Handcrafted sculpture representing a family of five. Made using the sand-casing method. This artistic piece reminds us of the closeness and joy of family. Bronze finish. 5.5 in. L x 3.5 in. W x 10.75 in. H (2.7 lbs.). Danya B is a registered trademark of Danya B Inc.
With its head down and ready for battle, this large, strong buffalo is not to be reckoned with. 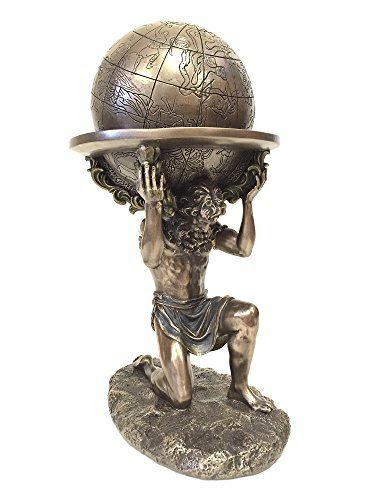 Standing on steep rocks and shown in a beautiful bronze finish, this statue would look great on any table. 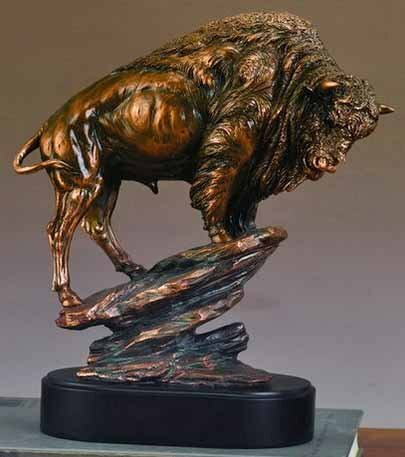 10"Wx12"H Buffalo (L) These sculptures are made using a bronze electro-plating process. The result is a fine sculpture with great detail and high quality for less than half the price of solid bronze. 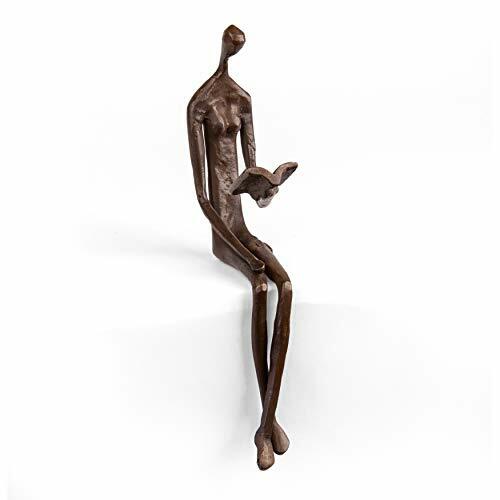 Add a touch of style to your home decor with this handcrafted bronze figure of a woman sitting over a ledge with a book. This unique decorative accessory is perfect for the reading enthusiast. Handcrafted and cast using the sand-casting method. Must sit over a ledge on a table, bookshelf or mantel. Danya B meticulously crafts goods that appeal to modern contemporary tastes that will surely add charm and vibrancy to any living space! 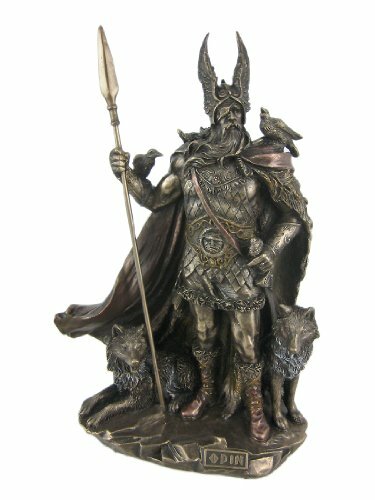 This gorgeous 9.75 Inch Norse God - Odin Cold Cast Bronze Sculpture Figurine has the finest details and highest quality you will find anywhere! 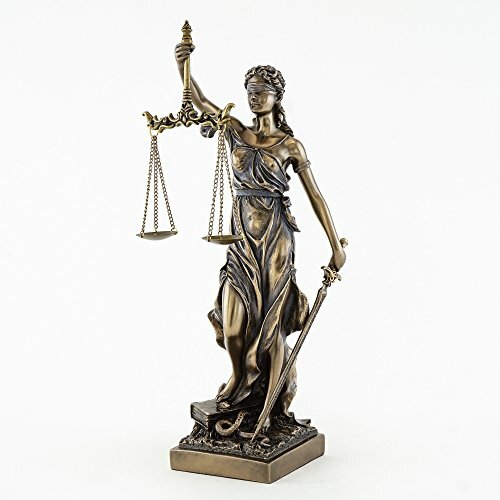 9.75 Inch Norse God - Odin Cold Cast Bronze Sculpture Figurine is truly remarkable.9.75 Inch Norse God - Odin Cold Cast Bronze Sculpture Figurine Details: ; Condition: Brand New ; Item SKU: SS-US-WU75357A4 ; Dimensions: H: 9.75 (Inch) ; Crafted with: Cold Cast Bronze ; More Information: Sculpted and handcrafted to the finest detail in cold cast metal (Bronze/Pewter) finish. The bald eagle is known as a symbol of independence and freedom. 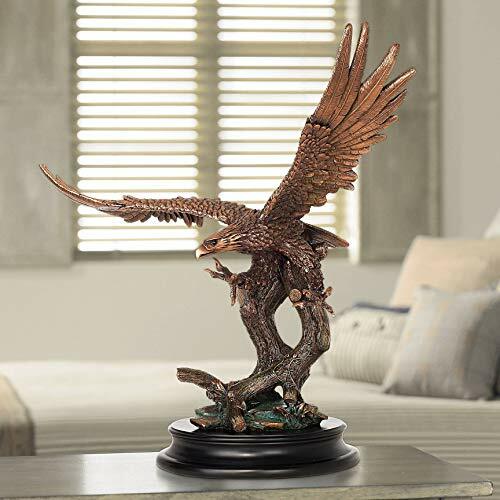 Our dramatic sculpture captures the essence of this noble animal through incredible detailed and realistic craftsmanship. Based on an original sculpture, the scale of this work is breathtaking. 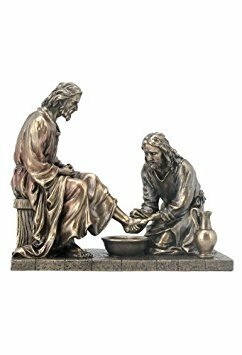 It is crafted from cast resin construction and hand-detailed in a beautiful bronze finish. This work will be a favorite display item in your home.